The second drawback of JMX lies on the client side. JConsole, although not terrible, has very limited functionality. 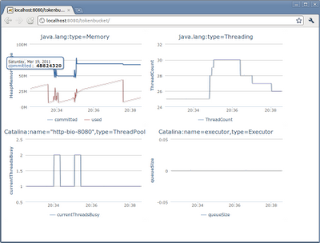 If we want to present our JMX-enabled application to the customer, showing JConsole as a client is a bit embarrassing. It is capable of showing graphs, but you cannot display more than one attribute at the same composite graph and you also can't observe attributes from different MBeans at the same time. Last but not least, again, we're living in the XXI century, Swing client? Weird RMI port? What about Web 2.0 rave? Knowing how much I love charts (and how data visualization is important for diagnosing and correlating facts) I felt really disappointed by JConsole capabilites. And the only rival of JConsole seems dead. I knew exactly what I wanted: HTTP transport for JMX server, so that I can easily access MBeanServer from outside without the RMI mess. Jolokia meets my expectations perfectly. This small library (about 170 kiB) connects to a given MBeanServer and exposes it via REST-like interface. 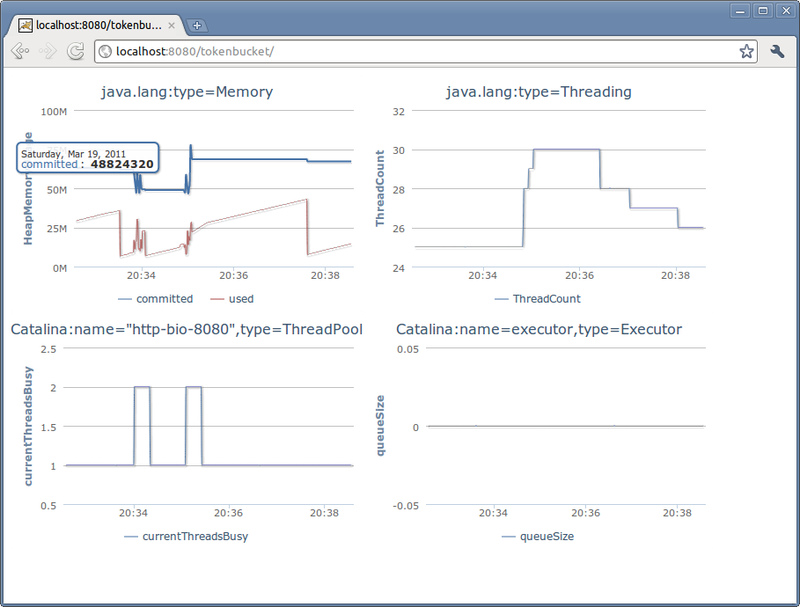 Just deploy the jolokia.war file on your servlet container and use whatever HTTP client you want to monitor your JVM! 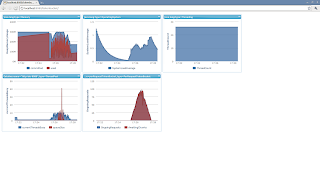 So the next time your customer asks for a monitoring solution or you want to enrich existing application without modifying it too much – consider the simplest solution, as it might be the best one as well. And maybe this tiny dashboard code is a valuable milestone of a decent successor of aforementioned JManage? Where can be found more such quotes from Nicolaus Copernicus? @Anonymous: look at the very end of the article ;-). MX4J is also a great library to integrate JMX pages with http and most useful if you want to open JMX page in browser. But this is a nice piece of work. thanks for sharing. By the way, my favorite use of JMX/JConsole is for exposing and run-time configuration of log4j loggers using it. In case you are interested, google 'JMXWatchDog' term. The problem with RMI is that it is bound to Java (and often - to a particular JVM vendor/version) so it isn't easily available outside the Java world. As for JMX and logging, Logback provides built-in support for JMX, allowing you to change logging levels at runtime. Isn't there an open source lib alternative to Highcharts? Useful post, thanks. FYI JConsole is being replaced by Visual VM, which is also now included in the JDK. Just type 'jvisualvm' on the command line, though you need to follow a few simple steps to have it display the included MBeans plugin. The MBeans view looks almost identical to JConsole though it separates the metadata from the attributes/operations themselves. Unfortunately, it also doesn’t appear to follow the ObjectName navigation that Vilas found that works in the HTML Adaptor. Be nice if they updated the decade old HTML Adaptor. "VisualVM combines the best of several other Sun-provided Java tools such as the visual tool JConsole and command line tools such as jinfo, jmap, jstat, and jstack." @TerminatorJoe: thanks for the tip, but I am already using JVisualVM and find it a great replacement for jconsole. JVisualVM provides great (and free!) Java monitoring environment, especially with a set of plugins (in fact, MBean support has to be enabled by plugin as well). 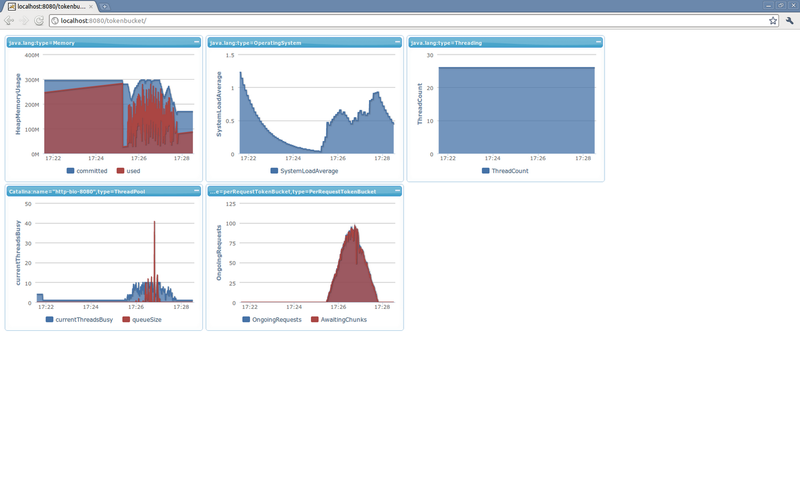 I enjoy Visual GC plugin in particular - full access to garbage collector and memory consumption statistics in real time. 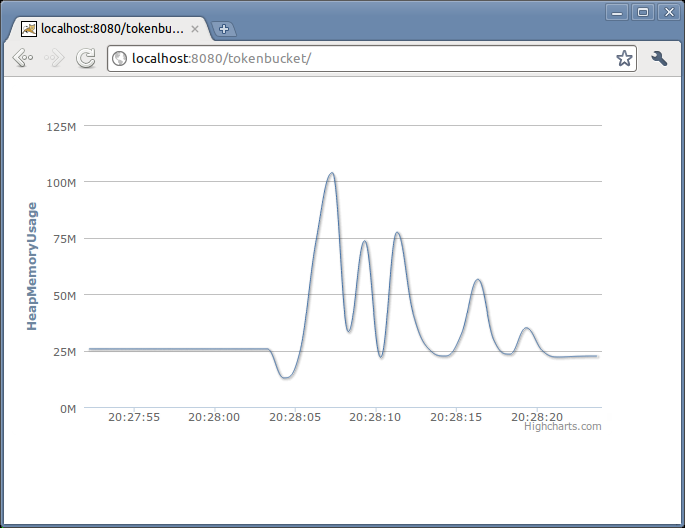 How do you configure the web service, so that the jolokia call is always from the jolokia client server (web server)? 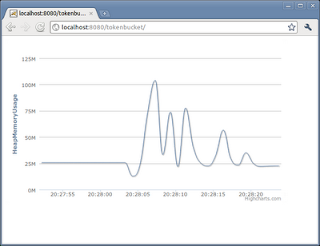 If I open a browser on the web server, I see the data. If I open a browser from my desktop, and access the app, there is no data...because my desktop does not have access to the jolokia agent. I am attempting to write a frontend to the jolokia agent, and integarte with my Nagios interface, to provide realtime output for our java apps. But if I can only see data while logged directly into the nagios server, it doesn't help for the average user. Jolokia agent is exposed as a servlet. This servlet can be accessed from any computer that can access your web server/application. However in this particular case I am calling Jolokia servlet using AJAX. Unfortunately, due to same origin policy, AJAX can only access URL hosted on the same origin (server/domain). I believe this is the issue you are experiencing. You can use any HTTP client library, including curl to access Jolokia. But if you want to use AJAZ, the page must reside on the same server as Jolokia. Since Version 1.0.3 Jolokia supports CORS. By default it allows cross domain request from everywhere, but this can be restricted within the Jolokia Security policy. So, with modern browser you should be able to access Jolokia from everywhere, even with Ajax.